Mating season is once a year, from March to May. Sexual maturity in both sexes occurs at 5.5-6.5 years. 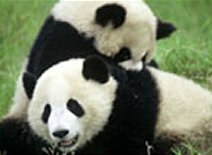 Communication between the male and female Panda is through scent and four different calls which are only used during mating. Unlike other bears, Panda males will often roar to announce their presence to receptive females. 2-5 males may compete for a single female, the male with higher rank gets priority. 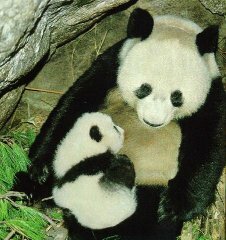 The female Panda is in heat from 2 to 7 days and may mate with several males. Copulation normally takes place in a manner similar to members of the canine (dog) family. During mating the male may bite the female's nape. After mating the female will often try to bite the male. Through a remarkable process referred to as delayed implantation, the fertilized ovum divides a few times and then floats free within the uterus for a few months with its development arrested. 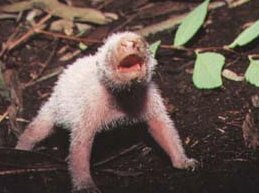 Sometime around June or July, the embryo will attach itself to the uterine wall and after a gestation period of three to five and a half months, the giant panda female will enter a rock cavity, bamboo thicket or hollow tree to give birth. 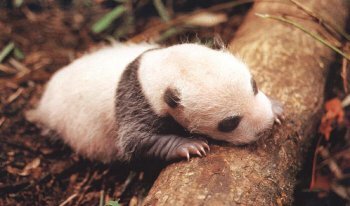 Baby panda's weigh only 90 to 130 grams (3.5 to 4 oz.) at birth - about 1/900th of its mother's weight. Litters of one or two cubs are born. If two cubs are born, the mother usually abandons the weaker cub. 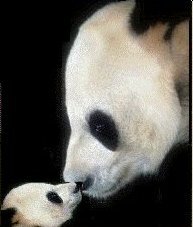 At birth, pandas have a fine white fur. Cubs are born blind and open their eyes at about 45 days. 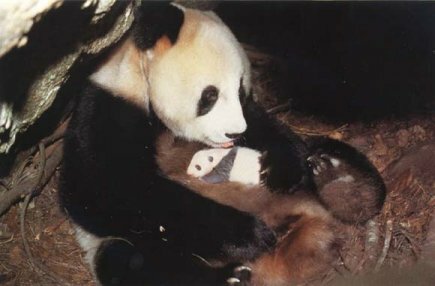 Cradling the newborn cub in her forepaws, the mother will hold the cub so that it is able to suckle. Young cubs need to nurse as many as 12 times per day. Within 2 weeks, their skin turns gray where eventually the hair will be black. 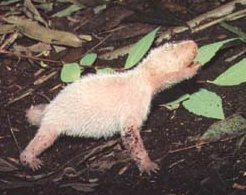 Cubs have panda fur coloration within one month after birth. The cub starts to crawl at 75 to 90 days. 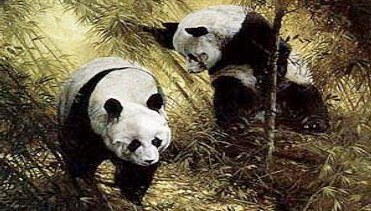 The female regularly leaves the den for two to three hours to forage on nearby bamboo. Giant panda cubs are eating bamboo by the time they are 6 months old and are fully weaned by the time they are 9 months of age. Cubs and mothers play: The mother rolls the cub and wrestles with it and the cub climbs on the mother's back.